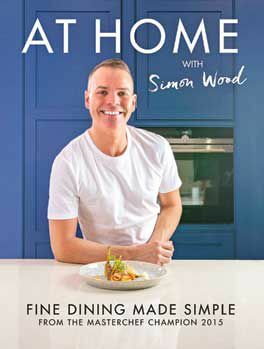 This week’s book is At Home by Simon Wood, the 2015 MasterChef winner. The book is all about elevating your everyday home cooking to the next level using some of the tricks that Simon has learnt since he won the BBC show. I recommend the dishes opposite, the harissa lamb cutlets with sweet potato, pomegranate and almonds, as I just love all these flavours together, and a classic mint chocolate soufflé. It is always nerve-wracking trying to get the perfect soufflé – but give it a go as the results will be worth it. Ciao until next week. Preheat your oven to 200°C/392°F/Gas Mark 6. Chop and de-seed the red chillies. In a large dry frying pan heat the caraway and coriander seeds and then pound in a pestle and mortar. Using a food processor, blitz the chillies and garlic cloves into a paste, then add the toasted and ground seeds, salt, paprika and olive oil. Blitz into a smooth paste then cook off in a frying pan on a medium heat for around 3 minutes. In a large frying pan-sear the lamb making sure all of the exposed meat and fat is browned. Next, generously coat the lamb with half of the harissa paste and place in the oven for around 12 minutes. Remove and check the internal temperature with a meat thermometer. It should be around 63°C. Coat the meat again with the rest of the harissa and leave to rest. Slice the potatoes into 2cm thick slices and then, using a 3cm round cutter, cut out 3 rounds of sweet potato per person. Drizzle with olive oil, season and roast in the oven for around 15 minutes at 190°C. Halve and de-seed the pomegranate using the back of a spoon to knock the seeds out. In a dry frying pan add in the almonds and smoked paprika. Toast them off and remove from the heat adding a little squeeze of honey. Carve the lamb and leave to rest. Place it standing up alongside the potatoes. Add the micro coriander, sweet sticky almonds and finally the pomegranate pearls to give the dish that vibrant colour. Firstly, chill your ramekins for 30 minutes. This will help the butter adhere to them quickly and prevent sticking. In a saucepan melt a little unsalted butter and then remove your ramekins from the fridge. Brush them with softened butter. Chill the dishes for 5 more minutes and repeat this step. Then grate a little chocolate into each dish, so that it sticks to the butter. Rotate the dish around, so the ramekin is evenly coated. For the crème pâtissière, mix together the flour, sugar and cornflour. Then put the egg yolk and the whole egg into a bowl and combine. Add in half of the flour mixture to create a smooth paste, then add in the rest of the flour mixture and whisk until smooth. For the ganache, chop the chocolate into small pieces. In a saucepan add the milk and cream and bring just to the boil. Remove from the heat and add the chopped chocolate. Leave for a minute and it will melt. Stir continuously and slowly add in the cocoa. Set aside, allow the mixture to cool and then add in the mint. Heat the oven to 190°C/374°F/Gas Mark 5. In a completely clean bowl whisk the egg whites to soft peaks. As you’re mixing, sprinkle in the sugar. Once the sugar is combined, keep whisking to give stiff, firm peaks. Mix the crème pattissiere and ganache together in a large bowl and then stir in 2 tbsp of egg white. Fold in a third of the rest, then another third very gently, and then the rest. Add the mixture into the ramekins. Fill them a quarter of the way from the top, and then bang each dish gently on your work surface. Then top up the mixture and tap again. Bake for 15-17 minutes and dust with icing sugar to serve. Recipes taken from At Home with Simon Wood: Fine Dining Made Simple (£20, Meze Publishing), photographs by Marc Baker and Tom Astley. To order your copy, call the Express Bookshop on 01872 562310, send a cheque or postal order payable to The Express Bookshop, to Express Bookshop, PO Box 200, Falmouth, Cornwall TR11 4WJ, or order online at expressbookshop.com.